In the “Family Circus”, January 29th, 2010, the little boy came home from school, handing the report card to his mother and said, “Here’s my report card. I’ll be in my room practicing being grounded.” He knew that his mother would not be happy with his grade. He had rehearsed all the way home from school how to tell his mother. And he was ready to accept the consequences. Have you ever doubted that God really loves you? Some of us do. We might have committed some serious sins in the past. You might have hurt somebody. You might have committed an abortion. You might have committed adultery. You might have cheated on your spouses. You might have said something hurtful to members of your family. Whatever you might have done wrong; and you have already gone to confession and received forgiveness; however, the guilt is still lingering on in the back of your mind. You continue to feel bad about what you did. You seem not able to forgive yourself. You have not forgotten what you did. You are not sure if God has forgiven you. You are not sure that the person you hurt has forgiven you. You don’t feel normal again in your relationships with God and/or with others. If that is the case; you are like this young man. He cannot forgive himself. And he thinks that his father is not going to accept him back as his normal son. His focus is on how guilty and unworthy he is. But he is wrong. “While he was still a long way off, his father caught sight of him, and was filled with compassion. 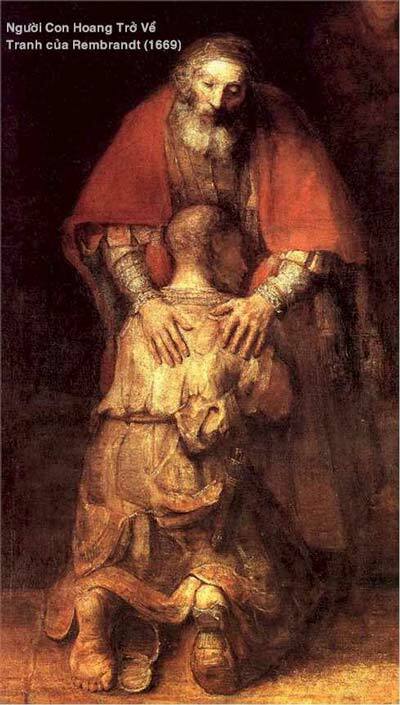 He ran to his son, embraced him and kissed him . . .” The father in the story does not dwell on the hurt, the anger, and the disappointment of the son’s past sinful behaviors. His focus is on the new relationship. His love for his son never stops during the time his little boy was gone. He understands how remorseful his son is. He knows his son wants to be home. And that is enough. So he stays focused on loving his son and doing good things for him and opening a party to celebrate his son’s return and make up for the times and opportunity that had been lost. The father’s actions help to lift the guilt from the son’s consciensce and reactivate his sonship. It is not easy to let go of our anger, disappointment and hurt in order to heal a relationship. In the Broadway play, “A Raisin in the Sun,” a father dies survived by his wife, a son and a daughter. Each has a different idea on how to use the father’s inheritance. The widow wants to buy a new home. The daughter sees it as her opportunity to go to medical school. The son wants to go in business with a friend. So the son gets the money, gives it to the friend, but the friend absconds with it: skips town. And the son has the difficult task of telling his mother and sister that all the money is lost. “Honey, the time to love someone is when they’re down-and-out. The time to love someone is when they’ve made a mistake in their life and they feel bad. The time to love somebody is when they have nobody to reach out to.